This page is intended to provide InnoCentive with feedback on the new challenge data published next to selective challenges on their Open Innovation web portal. The mockup below offers some minor design changes that bring a few simple but useful contextual elements to the display of challenge data, and better utilise colour in the aesthetic. 1. Green line for Solver and Submissions data curves is a purely aesthetic improvement. It is recommended that InnoCentive branded colours be used here. 2. Red marker indicates the progress of the challenge. Placed between the green "challenge start" marker and the red "challenge end" market, it provides simple yet very valuable visual cues as to time elapsed, and time remaining. This supersedes the distance markers on the sliders, which have been removed in the "Suggested enhancements" mockup. 3. Challenge start and end dates (taken from the coded values in the InnoCentive challenge management software database, without manual entry) added to provide context as to total challenge length. This provides more visual context of the challenge duration. 4. In the first image, the Submissions data curve appears slightly truncated as an artefact of high submissions early in this sample challenge. In the second image, the highest point of the data curve is shown to dynamically determine the height of the graph itself. This one might be tricky to code, but its values is in avoiding truncated data loss and/or large vacant spaces between the graph headings (i.e. "Solvers", "Submissions") and their graphs. The truncation will become a larger issue as InnoCentive continues to grow its Solver community. 5. The solver map has been redesigned to utilise a heatmap visualisation rather than map pegs to ensure portions of the map aren't obscured, as most of Europe is in the first image with some many countries clustered so close together at this small resolution. The world map itself has also been refactored from the Google API's default homuncular world map which shows countries in warped proportions. The second image also includes all major land masses (although note that numerous pacific islands have been cropped). 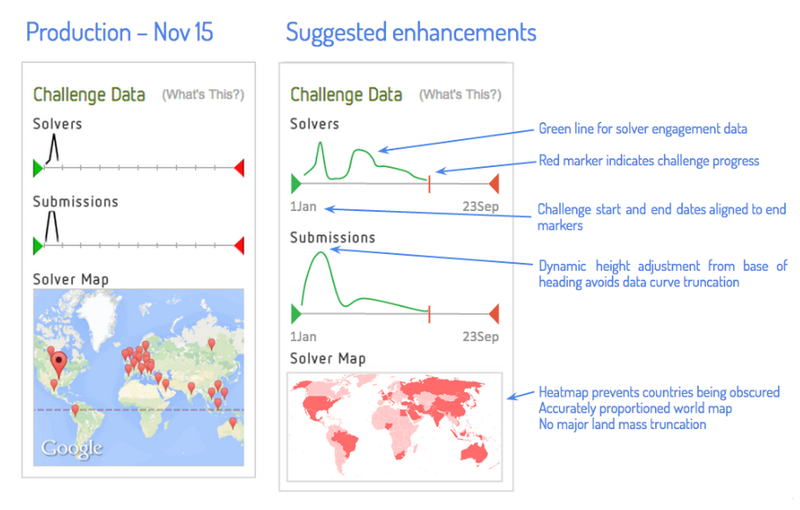 Although not perfect, this format allows for a more complete view of global activity on the challenge, and is more inclusive across InnoCentive's global Solver community. These enhancements are offered by the author to InnoCentive freely with the sole aim of helping InnoCentive improve its commercial services. This article was produced and published in the spirit of open innovation.